BotCon_07_cr, originally uploaded by BenSpark. Wheeljack was my first Transformer and this person made a SWEET! 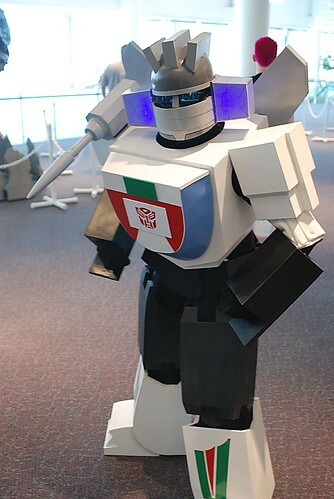 costume that is dang near perfect of my favorite Autobot Mad Scientist. Wow, that is a great costume! I am a little scairt! No reason to be scared, Wheeljack may be a mad scientist but he definitely a force for the good. Michelle, Yeah it is pretty awesome, someone worked very hard on the costume. That IS a sweeeeeet costume! WOW! Lotta work went into that one! HA HA HA! “More than meets the eye”, eh? That’s so cool! I wish I had one! My husband would definitely find that sweet! I’ll have to show this to my sons. They have loved Transformers for years and would agree with that interpretation of “sweet”!! sweet! i like that costume! great photo hunt, something different, u know…have a good weekend! Thanks Amy, I think this is pretty sweet myself. I hope your sons like it Barbara. Thanks for commenting. That was a really good costume. One of the best I have seen this weekend. Mott, You said it. Thanks for commenting. Thanks Jenny, I figured that my version of sweet would be appreciated. So I guess there is no question that you’ll be seeing the Transformers movie this summer. That is one sweet costume. Puts my homemade costumes to shame. what an awesome shot–and very sweet! It would be cool if the costume did transform, but it does not. Still very cool though. I am always amazed at the amount of work people put into costumes…this creator is obviously talented…very neat! Hey there Birdie, I have already seen the movie twice and as a fan of 23 years I give it my full approval. It was so good. Hi Lynn, wasn’t the movie excellent. I can’t wait to see it for a 3rd time. Thanks for the comment Chepot. I am having a great weekend at BotCon 2007. I thought the shot was pretty good and Wheeljack certainly mugged for the camera. The creator of that costume did put lots of work into that costume. It was very very good. Yes it is MommyBa, it was the best costume at the show. Hey Mark, I guess I should have asked that. Now, how can I get one? In one sense… sweet, sweet piece of technology. In another sense scary… as in, I wouldn’t want to meet him in a dark alley! Excellent picture – I famed and fueled you! Us big boys are also giving it a collective SWEET! You gotta invest some time and money and patience to make one of those, can’t buy them in stores, that is a custom job. Thanks for dropping by. Hi DCA, I’m sure that it was stifling in that costume. The woman inside had a few costumes this weekend, the other one was the Baroness from Cobra. SRP, Wheeljack is a good guy, he’s second in niceness to humans only to BumbleBee. You’d more likely be harmed by one of his wacky inventions instead of by him. Hi Margaret, Thanks for dropping by and commenting. Hi there Sanni, thanks so much for the fuel and the fame. Glad you dropped by for a visit.